Oh, Walt Disney. Either you love him or love to hate him, or maybe a little of both. "Walt Disney had a hard childhood and knew as well as anyone else that "the good old days" were not all good, but he also understood that they take on a new significance as they slip into the past. Memory tends to strip the past of its quotidian hardships while abstracting the positive values that transcend the shifts of circumstance. Disney made every effort to sharpen our picture of the past by focusing on those details which seem significant in retrospect. Disneyland's Main Street and the adjacent Town Square area...are designed to evoke old values, a sense of neighborhood, and the compactness of society in a simpler age. "Walt Disney was a conservative man in that he believed that such old values retain their usefulness, if only as a reminder of what was once viable. I think it is fair to say that, for him, Main Street was a metaphor for a way of life governed by what can only be called common sense, and his belief in the validity of common sense permeated everything he did. 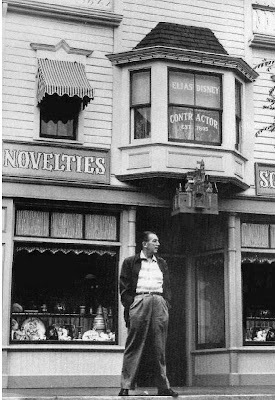 Of course, the paradox of Disney is that his common sense approach was always allied with a highly developed instinct for the creation of fantasy. It is the fantasy that lends an aura of enchantment to the Magic Kingdom-what other Main Street leads to a castle from the once-upon-a-time world of the Brothers Grimm?-but the fact that it is rooted in easily understood values makes the fabulous all the more accessible to the millions of visitors who enjoy it annually."